Caps, plugs or Seals the neck of the container to preserve the caulk for the next use. 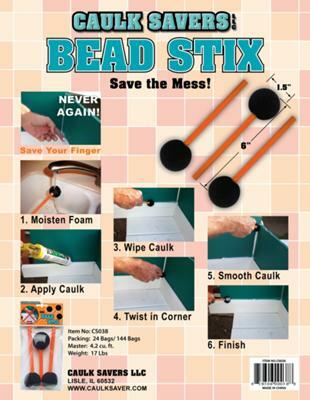 Caulk Savers,LLC, caulking tools are designed to cap, seal or plug any glues, cement, tar, adhesive, and store leftover tubes of caulks, sealants, or silicones that comes in a caulk type tube in order to save these products from drying out. They also work with spray foams and small squeeze tubes for caulking, as well. 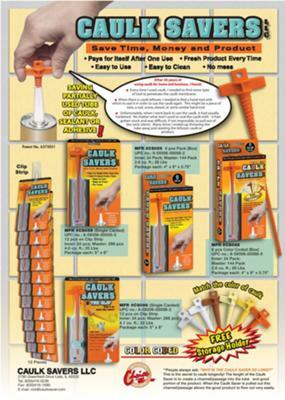 Caulk Savers, caulking tools, extends shelf life and allows you to store these products until you need them again. Hand Tools for Caulking and saving Product. The secret to caulk and caulk like products, longevity! The Length of the Caulk Saver and the Patented Threads, seals and create a channel/passage into the tube in the good portion of the product. When the Caulk Saver is pulled out this channel/passage allows the good product to flow out very easily. If the Caulk Saver was any shorter the product could still dry up in the stem of the tube. Every time I used caulk(caulk like products), I needed to find some type of tool to penetrate the caulk membrane. When there was caulk leftover, I needed to find something to cap or plug it in order to use the caulk again. This might a be a piece of wire, a nail, screw, dowel, or some similar device. Unfortunately, when I went back to use the caulk, it had usually hardened. No matter what devise I used to seal, cap or plug the caulk with, it had gotten hard impossible, to pull out of the neck (stem). Many times I ended up throwing the tube away and wasting the leftover caulk or product. This tool is, a Caulk Tube Saver and a “hand tool” for saving caulk. 1st secret. The Caulk Savers Patented Threads cut into the inside of the stem of the tube creating female threads. When the Caulk Saver is screwed down about three or four times it seats and will not allow any air to get into the tube of product. Now the tube is sealed from the inside-out, not like the other items that try to seal the tube from the outside-in. Outside-in allows air into the stem causing the product to dry out. 2nd secret. The Length of the Caulk Saver creates a channel/passage to allow the product to flow out easily. If it was any shorter the product could still dry up in the stem of the tube. Proven through 8 months of professional testing. The Length of the Caulk Saver and the Patented Threads are the key. In Business going on 11 years. Please visit our website at www.caulksaver.co for further information, and give us a call or email with any questions.